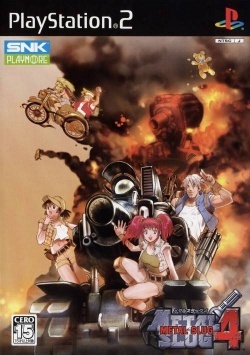 Game description: Metal Slug 4 is a direct port of the arcade and NeoGeo version of the game. New PS2 extras include additional bonus missions and simultaneous two-player versus matches. The game retains the same gameplay as previous titles, with the addition of some new enemies, bosses, weapons, several new vehicles and a new bonus combo system. Runs at 500 %speed. Picture has lines in it. 1.5.0 (dev-275) Default Default Runs perfectly, no bugs detected. Bios: Japan v02.50, GSdx Renderer: D3D11 (Hardware). Released in the US and Korea along with Metal Slug 5 as a double pack titled Metal Slug 4 & 5. This page was last edited on 29 January 2018, at 19:50.